Fatshark Games has announced that Warhammer: End Times—Vermintide will be out on October 23, precisely one month from today. And if you missed the brand-new gameplay trailer that debuted yesterday on the The PC Gamer Show, you can catch up with it here, too. 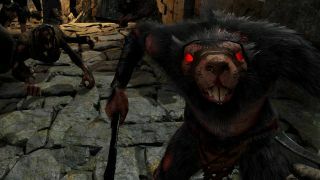 I was iffy on Vermintide when I first heard about it—"Oh boy, more rat killing"—but the more I've seen, the more enthusiastic I've become, especially after Evan declared it the best game at PAX at the end of August. This gameplay video bolsters my optimism even further: It's a tad dark, but the action is fast and bloody, and I love the look of the environments. As I don't think we've covered them previously, here are the Vermintide system requirements. Rather oddly, Steam only lists the minimum spec, but given how light they are, I wouldn't expect the recommended hardware to be overly onerous. A Warhammer: End Times—Vermintide beta will run for at least one week prior to launch, with access granted to any and all who preorder. Find out more at Vermintide.com.